After my first post (SQLite CollectionViewSource) someone asked me how to add users without the datagrid on a “clean” way. So the only way that I know to solve this problem was to write an ADD query yourself. It’s not that big of a problem but it’s not that nice as with the datagrid! So isn’t there really a better solution? The ORM will also handle the manipulation you did with that list. 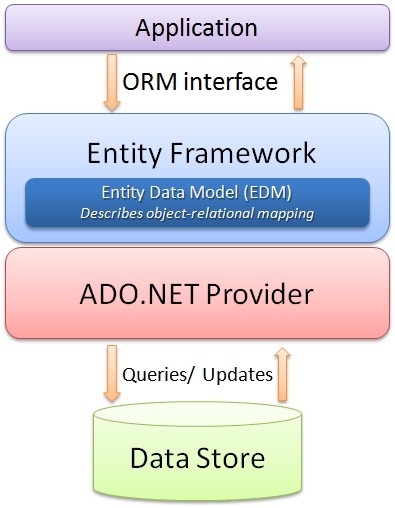 If you add an object to the list, the ORM will execute the ADD query. If you change an object in the list, the ORM will execute the UPDATE query. 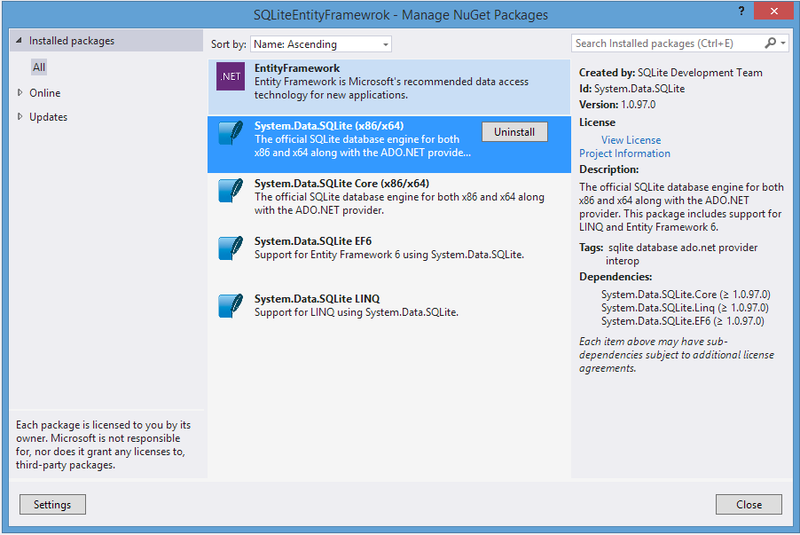 Make sure you added the last version of SQLite to your Visual Studio Project with the NUGET manager. All the other packages should also be installed (normally they install automatically with SQLite…). This page is a total mess! But you have to search for the x86 version and the .NET framework version you are targetting in your project. Last you need to download the bundle version! One last note, you really need the x86 version! Even if you use the x64 version of Visual Studio!!! If you installed this be sure to restart Visual Studio! Also rebuild your project! Now we need to add the Entity Data Model. This will contain the necessary code you need to talk OO with your SQL(ite) Database. 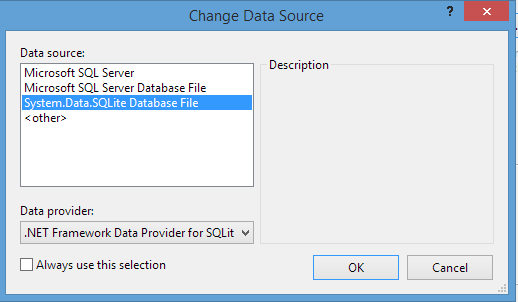 Because we already created our SQLite database we need to make a design from an existing database (the first option). This should be the next screen you see! Add a new connection. 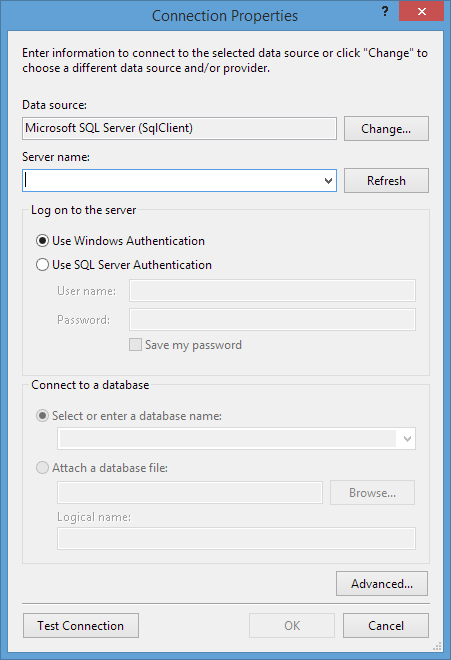 The default setting will use a Microsoft SQL server. This is not what we need! So click change. So the tricky part starts. If you don’t see System.Data.SQLite Database File you installed the wrong bundle from SQLite! But first check which .NET version you target. 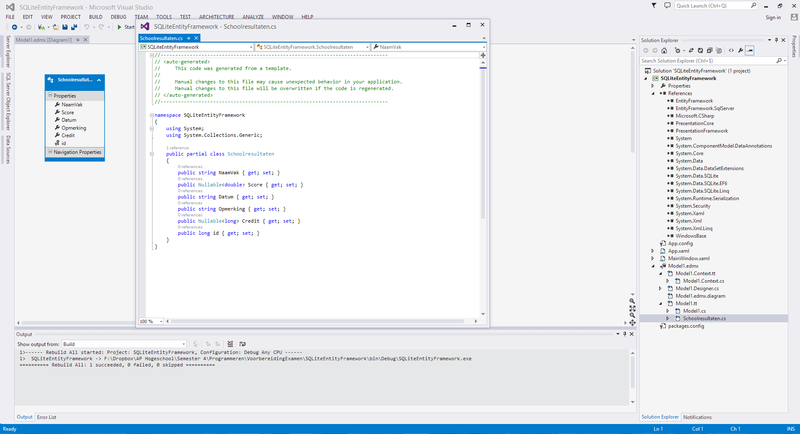 The default setting in VS 2013 is .NET 4.5. I downloaded the .NET 4.5.1 version of the SQLite software. So don’t forget to change this or install the correct version for your needs! If this isn’t the problem make sure you have a x86 version! Don’t forget to remove previous installations of the SQLite software and to restart VS every time you (re)install the SQLite software! If you click on OK you can choose where your SQLite database is located. The rest of the settings can normally keep the default value. At last try to connect to the database, you should be able to do that @ this point! Click OK and check if the checkbox for including the connection in App.Config is enabled (this is default). Click again on next. 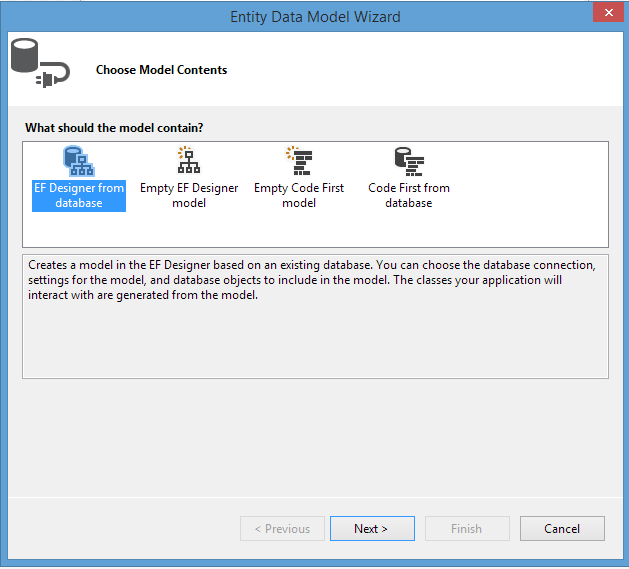 This screen will let you choose the information you want to add in the EF Model. In my case I want the “Schoolresultaten” in my model! 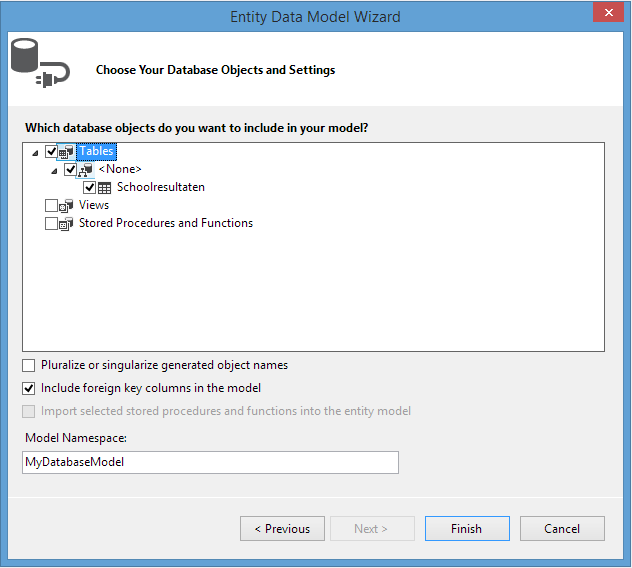 Here you can also change the name for your model. For simplicity I’ll keep this unchanged. My first try to do this failed because I was using an old version of the SQLite software. So please make sure you have the latest version and that this version is also the same version as the SQLite package you added with NuGet! But somewhere there should be a .cs file with the same name as your table name in SQLite! In this file there is the class that should have the same fields as your table! I used exactly the same UI as in my previous post! But there is a nice way to add the datagrid to your UI. 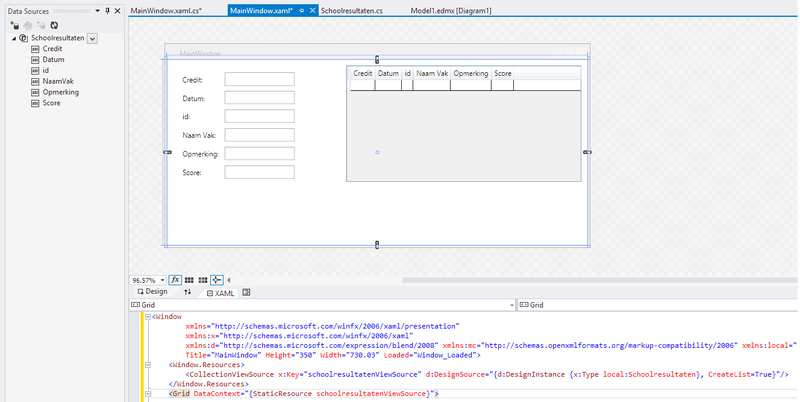 Open Datasources (View -> Other Windows -> Data Sources) and click add one. Now you can chose which class(es) is your “Data Source”. In my case the “Schoolresultaten” class. If you can’t see your class please rebuild your solution! If you get an error about that the file is already used, please rebuild your solution! If everything is okay your class is added as Date Source. Now you can easily add the datagrid, make sure your on your Window than click the arrow next to your class. Now you can choose different types of presenting your data. I included the DataGrid view and the details. You will see that the CollectinViewSource already is created for you! First we will search for the CollectionViewSource that is created in our UI. And than we will fill it with data. So the Refresh() method will get the data. First we check if there isn’t already data filled (we do this so we can reuse this method). If there is already data filled we dispose the object. Next we make a entity. This is a class that holds all the data. In our case is only has one list of Schoolresultaten. This class was automatically made by EF. If you want you can check this class, it’s in Model.Context.tt! The code for scrolling to the data is the same as my previous post. This is code is self-explanatory! I wanted to use the same TextBoxes. I also didn’t want to read every field separately. So instead I used databinding. 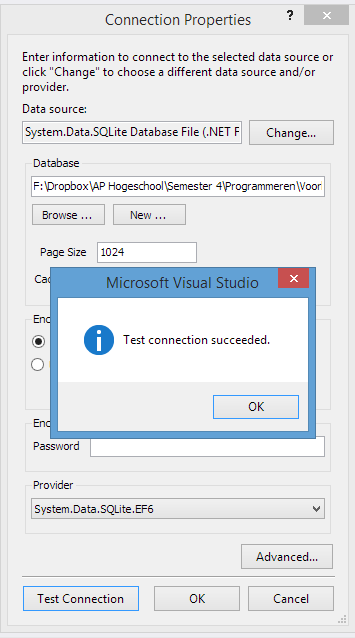 I change the DataContext of my stackpanel where my textboxes are in to a new “Schoolresultaat”. Because we use two way databinding the object will be updated! So I you press on the Save button and you filled everything in you just add that “Schoolresultaat” into our list from our entitity. So how do we actually save the data know? 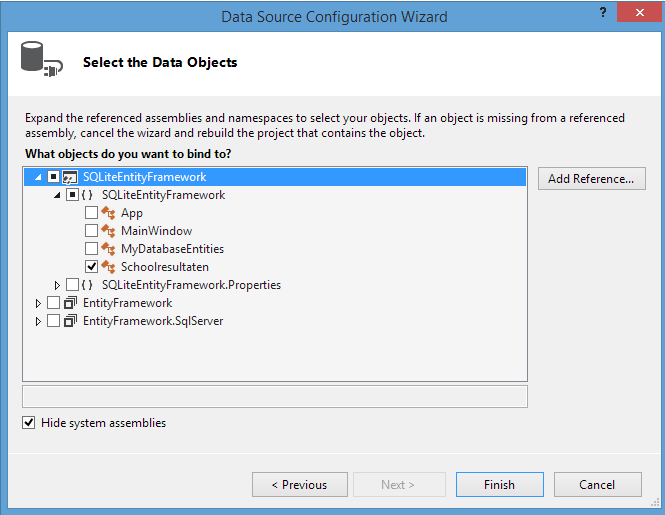 In my past project I had to make an Update query or use the command builder to generate the update query. But know with EF as ORM we just have to execute an update() function. The ORM will totally take care of the SQL queries that are needed to make the changes! This is the main reason why I built this tutorial in the first place. I think it’s a very powerful way to communicate with the DB! In my SQLite DB the PK was auto incremented but when I added a new “Schoolresultaat” with the grid or the text fields, my program crashed because he always used 0 as PK. You still have to say to EF that the DB will take care of the ID! Normally this happens automatically. But I changed my DB after I already made my model! Click on your model. You will see your fields. Search the one where you use auto increment. Open the properties of that field and change StoredGeneratedPattern to Identify! That where my basic examples. Ofcourse you should add some validation to the data and etc.! Hope you learnt something or found your answer! So know you’re ready to advance to MVVM! I have a post about it, I also use this example! 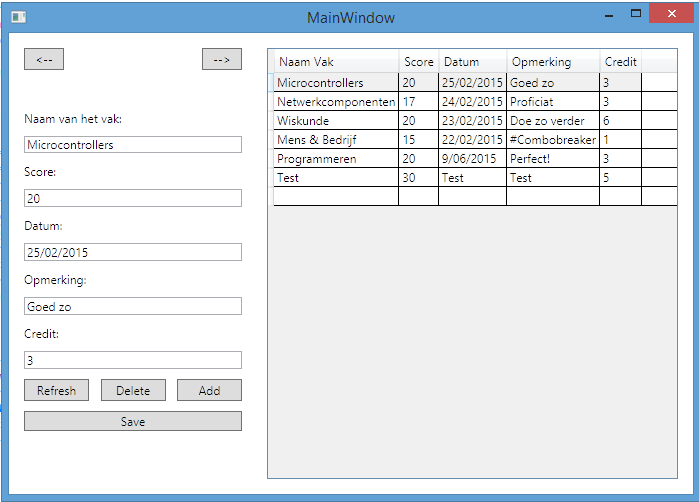 Check my other post: SQLite CollectionViewSource! If you have any questions or comments feel free to post them! 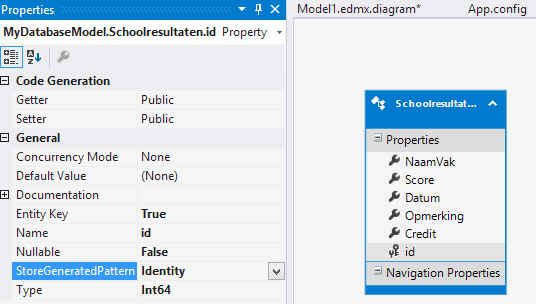 I am facing an issue where for me the load function is not available “_entities.Schoolresultaten.Load();” can you please let me know the reason. 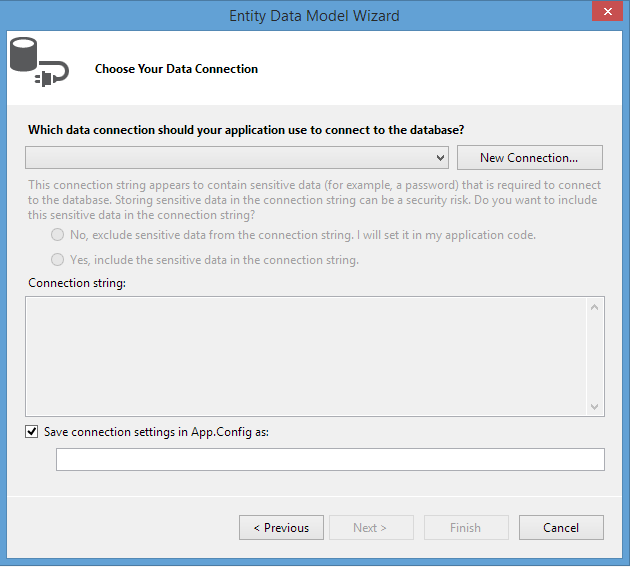 Did you add “using System.Data.Entity”? Thanks for the reply, yes I had added that namespace. I have another issue where I need your guidance because i am little new for this EF. I want to dynamically create sqlite db, table in different folders from UI & I want to switch between them at runtime. Like db is mydb.sqlite with items as table name. When my ui opens if db is not present then I want to create this db & connect to it. But with ur example I only create 1 db initially. How can create a db, its table, their EDM and connection strings of diff db. Is it like initially we go with one default db, table, conn string and by closing the DBcontext object of one db table then recreate for other db table here I don’t know how to create dbcontext after disposing it. Please guide me. Excellent !!! 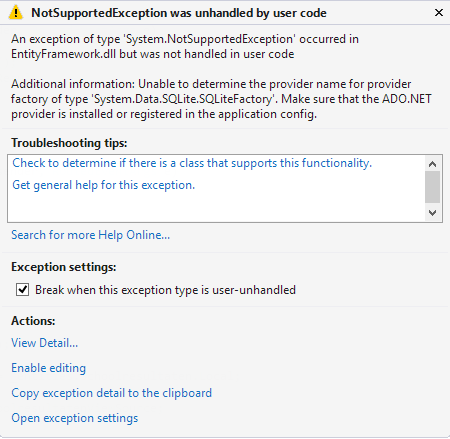 If I have a working SQL Server + EF 6 project using code first, can I just point to SQL lite and get it going? 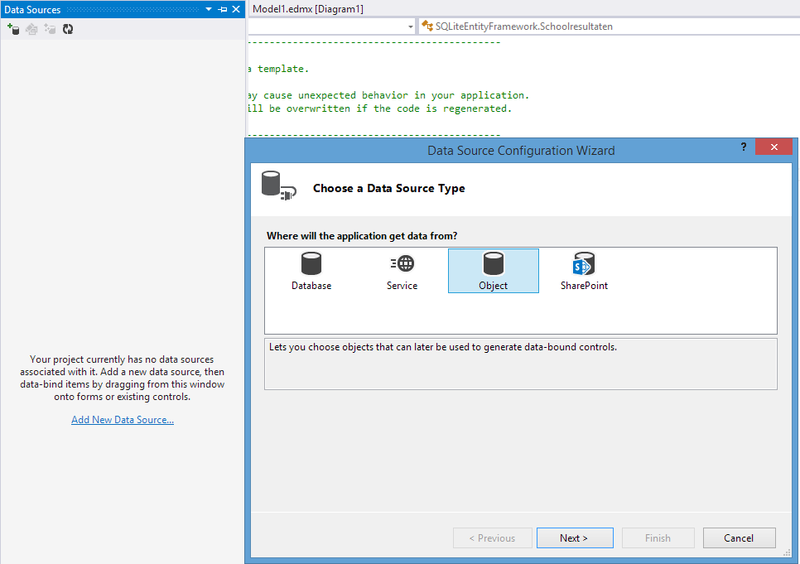 I understand that some config changes will be needed, but will that be all and is SQL server and lite compatible. Again, great post and very informative. Just thinking of taking app to SQL lite, if that is an option. That’s a very good question. SQL has support for more data types and more advanced queries. But the schema will probably be interchangeable. I have no experience on code first on EF6 using SQLite. Only on the new EF Core (there it’s a lot easier for SQLite). I would say try it out. Very useful information. For me it came to me in right time when need SQLite for my next App. Thanks a lot for the post.